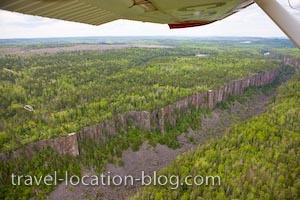 Situated on Lake Superior's northern shore is the spectacular Ouimet Canyon (sometimes known as Quimet Canyon). While the walls of the canyon tower to the dizzying heights of 100 metres, the canyon floor plays host to a medley of rare arctic-alpine plants. These 'cold-climate preferring' plants thrive because of the much cooler temperature there - snow often doesn't melt on the canyon floor until late spring. One of the best ways to see the full extent of the canyon is from a plane - it really is a stunning sight! Alternatively, you can drive to the Ouimet Canyon Provincial Park and walk the extensive network of boardwalks and trails to the viewing platforms.